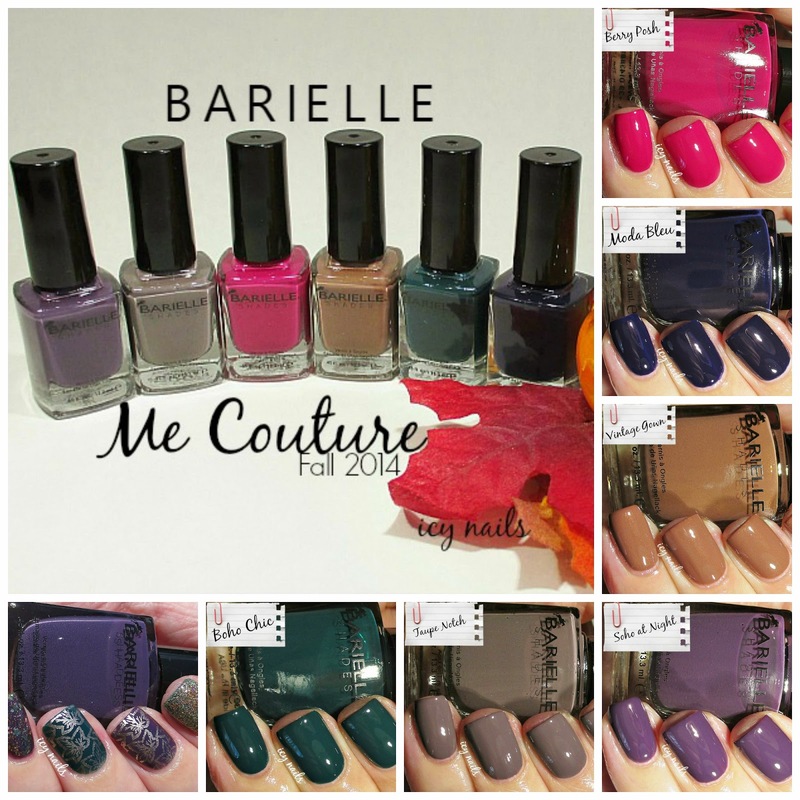 Barielle Shades for Fall 2014 presents the Me Couture Collection, this palette of six sophisticated shades, including classic and intense colours are perfect for this time of year. All of these swatches are two coats topped with Seche Vite, unless otherwise specified. This creamy raspberry crelly will brighten your nails all Autumn, long. Cobalt blue crelly. Yowza! I am loving this one. This creamy rust crelly has a hint of pink and a beautiful, hidden shimmer that fires in bright light. Ever so slightly dusty grape purple crelly. I needed three coats for this swatch, it had a tough time with my ridges. This grey based taupe crelly is sophisticated and chic. I dig grey polish and this one is no exception. Haw hard am I into this deep sea green crelly? I ask you. Rawr! I did three coats on my pinkie and ring nails because ridges. 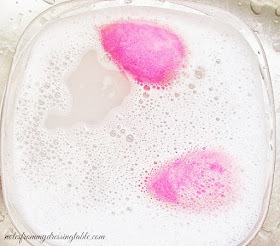 These five creamy crellies and one shimmer all have formulas of the fantastic. Viscosity is nearly perfect, these polishes flow off of the somewhat skinny, round brush, sit their asses down where they are told to, slip up the nail plate and self level very nicely. All six of these polishes are a tad thin, a little streaky on the first coat then become perfectly opaque and smooth on the second coat. I did need three coats for Soho at Night to be fully opaque over my ridges. All of these polishes dry in good time, even faster, topped with Seche Vite. I did a little nail art when I polished my nails after swatching these polishes. I applied Boho Chic and Soho at Night on random alternating nails then did some glitter on my pinkies, thumbs and index nails. On my middle and ring nails, I stamped Autumn leaves with China Glaze 2030 from plate BM H-11. I am going to be heartbroken when my bottle of 2030 is all gone. It is my favorite, perfect gold stamping polish and it is no longer available. 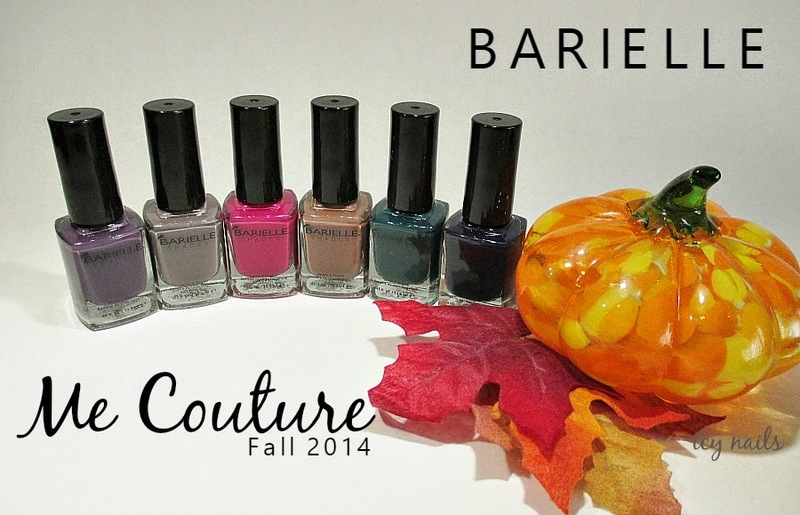 Barielle Shades Me Couture Collection for Fall 2014 is available on the Barielle website and from other retailers that carry Barielle nail polish and treatment products. 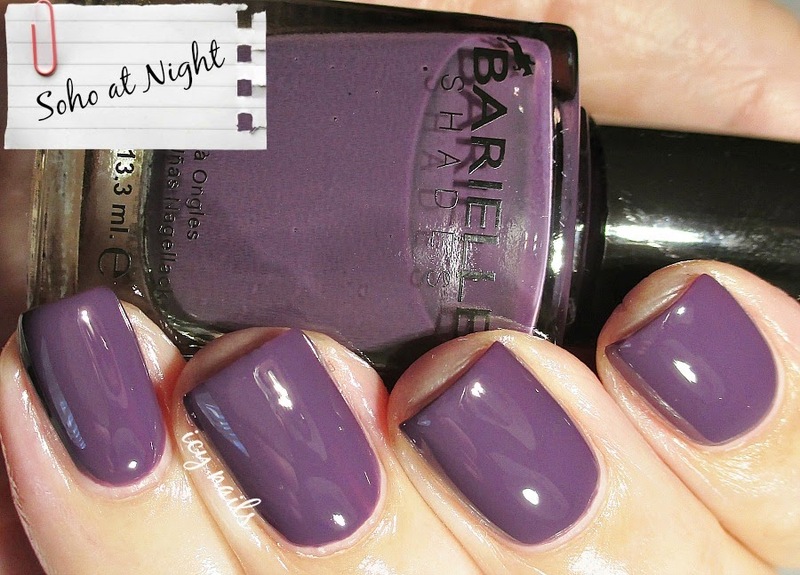 Barielle Shades polishes retail for $8.00 a bottle. You can LIKE Barielle on Facebook. Follow Barielle on Twitter. Barielle is on Instagram and on Pinterest. 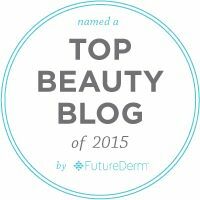 Did you see any polishes that you liked? Tempted to pick any up? 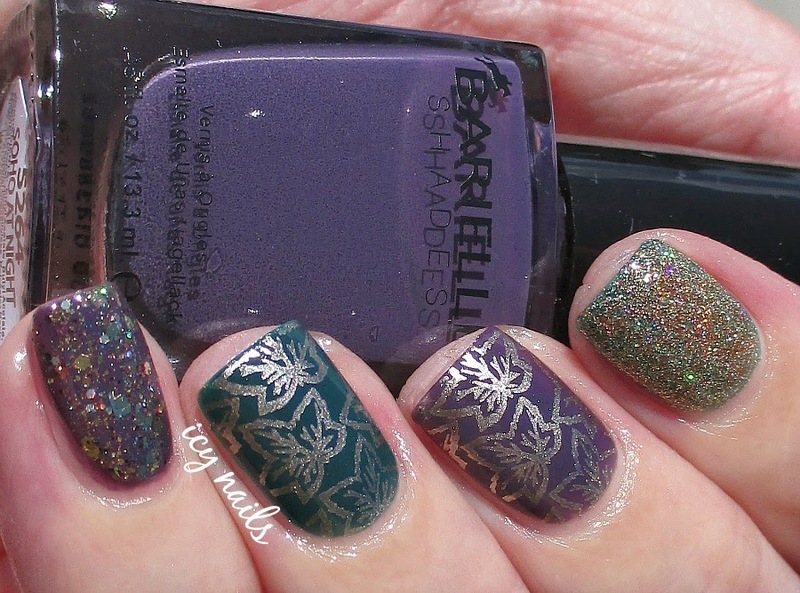 Do you wear Barielle polish? What are your favorite shades? Please do share. Thank you so much for popping in and reading this review. Have a great day and may your polish never bubble. Some great colors in this fall collection! I really like them. Love the nail art you did, especially the gold stamped leaves. Each and every shade is gorgeous! I AM IN LOVE! I like the Berry and the Moda Bleu. It is a beautiful collection, isn't it? A crelly is a hybrid of creme and jelly. Most crellies have the opacity and pigmentation of a creme polish and that translucency and bit of delicious squish of a jelly. Creme/jelly. Crelly. :D One of my favorite formulas, they usually apply like a dream, dry quickly and are mad shiny. This is perfect fall collection! Love it! 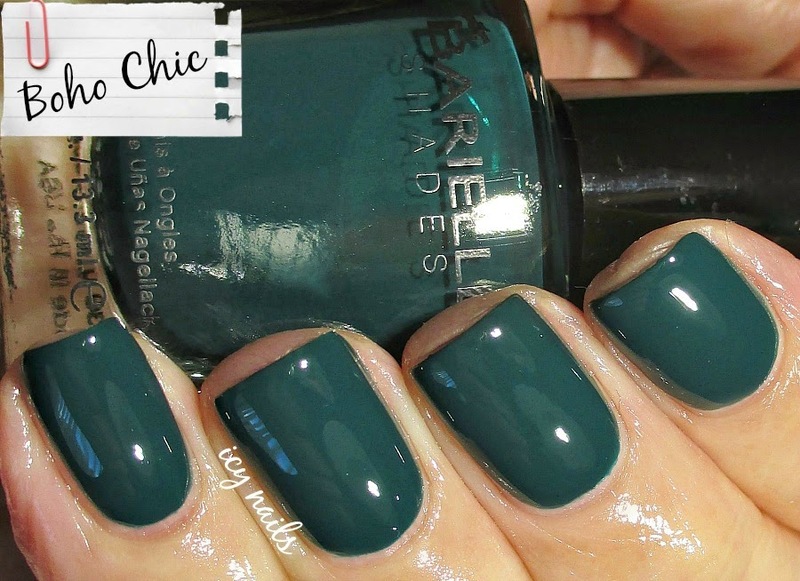 I love these shades for fall! amazing swatches! Love this collection! 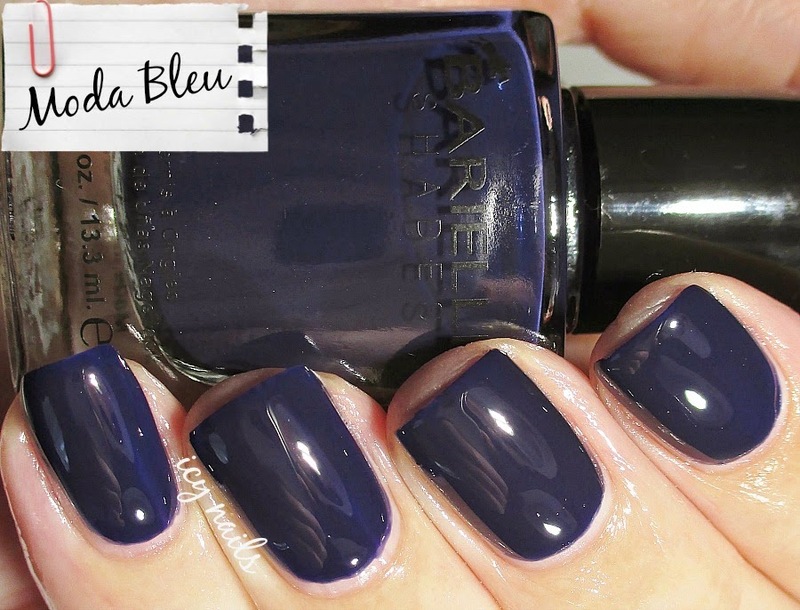 Moda Blue is fab and I LOVE that nail art--very chic! Beautiful! 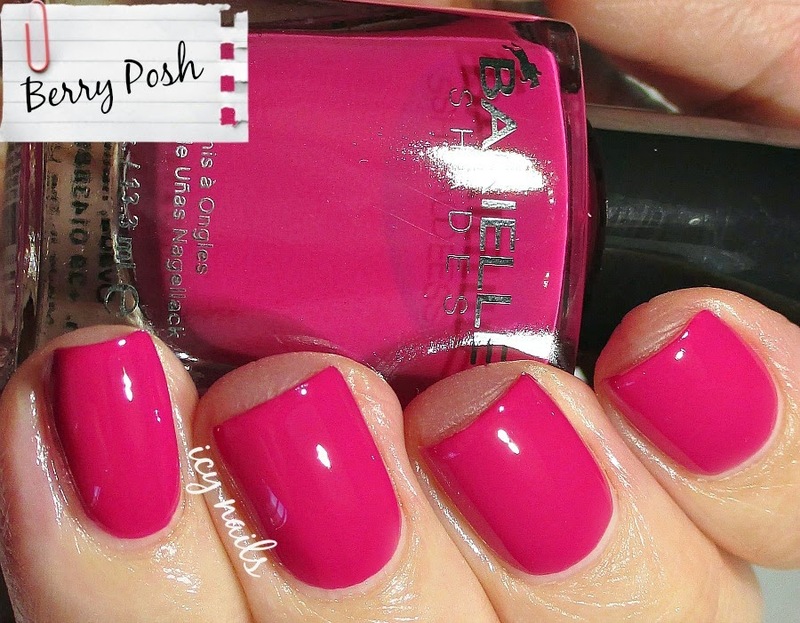 I love Berry Posh. This is such a beautiful collection! Love all these rich jewel tones for Fall. This berry has a fab formula. Moda Bleu is one of my faves of this collection. And thank you. Thank you so much. :) This is a good one. It's one of my faves of this collection. So deep and has that squish. I really love all of these colors. The darker ones especially have a bit of an edge to them that I really like. They are beautiful and perfect for this time of year. Ooh - I love your nail art. I am in love with Ever So Slighting and Taupe Notch... gorgeous. Gorgeous swatches! I think my fave has to be Moda Bleu! Thank you. :) I think that one is an overwhelming fave. Thanks. Swatchfests are great. Crelly rules. It is gorgeous and the formula on this polish line is so good. October Ipsy Bag: Am I Being Trolled? Sample Saturday: Benefit Watt's Up!